With Pixelmator Pro, you can batch process your images using seven powerful actions for the Automator app. These actions let you easily automate repetitive tasks by creating complex workflows, greatly speeding up editing your images. One great use of batch processing is applying the same adjustments to a series of photos. Say, if you’ve taken a bunch of photos at the same place, find a great look for one of the photos, and want to give the rest of them the same look. Below, we’ll check out how to do this using the new Pixelmator Pro actions for Automator. Automatically corrects the white balance of photos using the ML White Balance feature of Pixelmator Pro. Automatically enhances photos, balancing colors and improving exposure, using the ML Enhance feature of Pixelmator Pro. Applies the selected Pixelmator Pro color adjustment preset to images. Applies the selected Pixelmator Pro effect preset to images. Converts the image file type from one format to another. Resizes the images passed to it, either proportionally or freely. Deletes transparent or solid colored areas from the edges of images. The first step is choosing a workflow type — with Pixelmator Pro actions, you’ll mostly use the Workflow, Application, Quick Action, and Folder Action workflow types. In this section, we’ll create a Quick Action that you can run from Finder. So, when you open Automator, you can go ahead and double-click the Quick Action workflow type. WorkflowA workflow that you run from inside the Automator app. You specify the images you want to process using a dedicated action in Automator. ApplicationA workflow that runs when you open it or drop files or folders on it. With this action, you’d usually set it up to processes the images you drop on the application or images in a specific location. 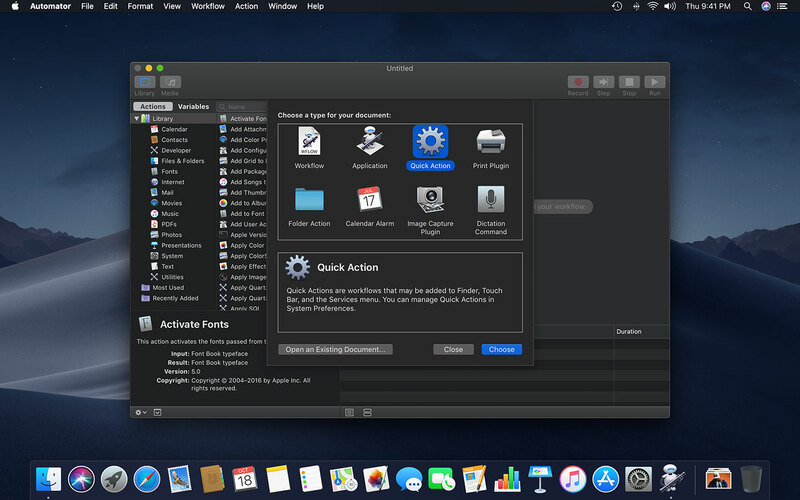 Quick ActionA workflow that you can add to Finder windows, the Touch Bar and the Services menu, which processes the images you select in the Finder. Folder ActionA workflow attached to a folder in the Finder. When items are added to the folder, the workflow runs and the files are used as input to the workflow. Other WorkflowsAutomator has other workflow types, but we’ll be focusing on the four above. The different workflow types in Automator all work in similar ways, they just give you flexibility in how to run the workflows. For example, Quick Actions are always available in the shortcut menu when you Control-click an image in Finder. With Applications, you can set up a specific location you’d like to place images to be processed and only start the workflow when you open your app. Or you can drop images onto the app to process them. Folder Actions let you drop images into a folder, starting the workflow as soon as the images appear in the folder. And the Workflow type is run from inside the Automator app itself. 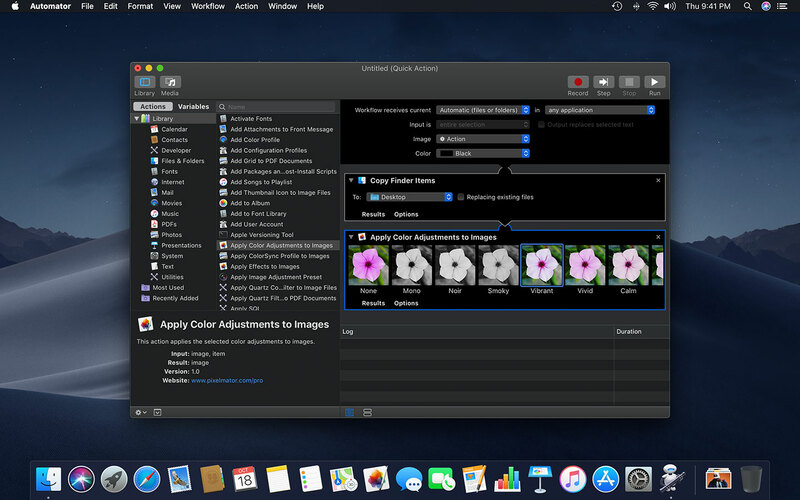 The next step is adding a Pixelmator Pro action to the workflow — in this case, we have a whole bunch of photos to which we need to apply the same color adjustment preset. Find the Apply Color Adjustments to Images action and double-click it to add it to your workflow. Because these actions modify the images that are passed to it, you’ll be asked whether you want to copy the items somewhere else first and work on the copies. Although you can also modify the originals, it’s best to click Add here and work on copies. By default, the Copy Finder Items action will make a copy of the images on your desktop, so that’s where you’ll find your processed images. After adding the Copy Finder Items action, click to choose which color adjustment preset you’d like to apply. We’ll use the preset called “Vibrant” that comes with Pixelmator Pro. You’re almost there! First, choose File > Save and give the action a name. Let’s call it “Apply “Vibrant” Preset”. Now, you can go test it out on a few images on your Mac. Open up the Finder, select a couple of photos and choose Quick Actions > Apply “Vibrant” preset. And voila! You’ll find the processed images on your desktop. To round things off, here are a few other example Pixelmator Pro workflows along with links to download them and test them for yourself. At the very beginning of the workflow, there’s a Get Specified Finder Items action. You can drop the images you want to process into that action, then click the Run button in the top right to start the workflow. 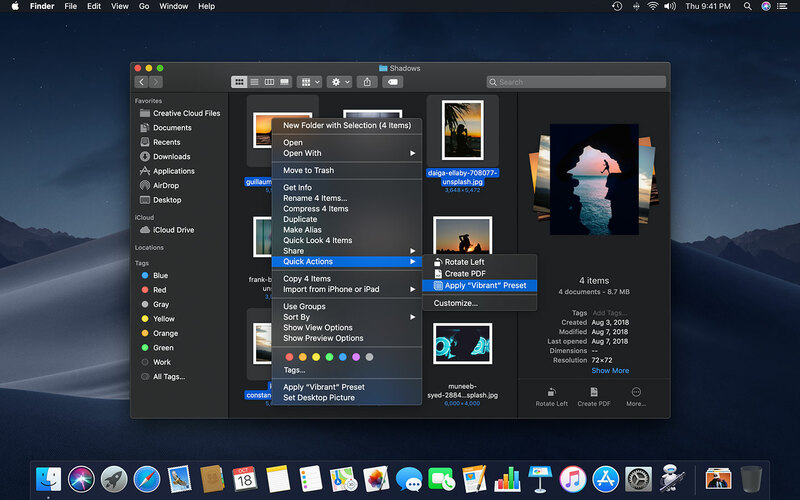 This action copies your images, converts them to the Pixelmator Pro file format, then applies a number of different color adjustments using the ML Enhance feature. This lets you prepare a series of photos for editing by automatically improving them using ML Enhance. What’s more, each adjustment will be visible and editable once you open your processed images as PXD files in Pixelmator Pro. Neat! This is a very simple but very useful action that lets you batch export a series of images to the JPEG file format, ready for use on the web. The Apply Effects to Images action makes the entire collection of effects in Pixelmator Pro available for batch processing. One very handy use is watermarking a series of images — if you create an effect preset in Pixelmator Pro with a Pattern fill effect containing your watermark, you’ll be able to batch watermark your images with ease. To get this action to work, you’ll first need to download and add the preset to Pixelmator Pro, then open the action in Automator.